Today’s bowling balls absorb oil which increases the ball’s friction and hook-ability on the lane. However, over time this oil absorption can have an adverse effect as the build-up of oil and dirt clog the bowling ball’s microscopic pores resulting in decreased friction and hook-ability. 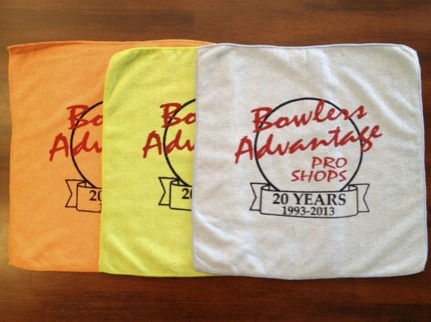 To maintain your ball at peak performance and to increase its usable life span, we recommend that you clean the ball every time when you are done bowling before you store it – all you need is a microfiber towel, any approved reactive bowling ball cleaner, and perhaps an abralon pad or two if you want to maintain a sanded/matte surface. We would be more than glad to teach you how to maintain your bowling ball for longevity and performance. 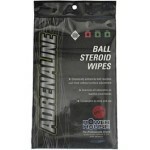 Another great product to help maintain your bowling ball reaction is Adrenaline Ball Steroid Wipes. These wipes use a micro-pore penetrating action that safely restores and increases oil absorption in all reactive bowling balls. We recommend you use the Adrenaline Wipes on your reactive ball every 3-6 games. The product is convenient and simple to use. Over time, the ball will maintain consistent performance longer versus a ball that didn’t have the benefit of Adrenaline use. 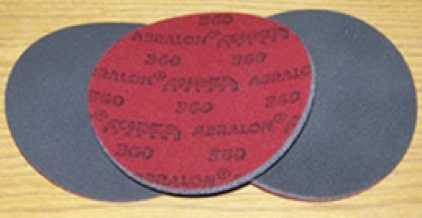 Abralon Pads: these are abrasive pads used to change the surface of your bowling ball. A ball with a rougher surface (lower grit) will tend to react sooner on the lane with more of an arcing motion whereas a smoother surface (higher grit) will tend to react later with more of a hockey-stick motion. You can purchase abralon pads from Bowlers Advantage in grits of 360, 500, 1000, 2000, 3000, & 4000. Resurfacing: Another very important key to bowling ball maintenance is periodic resurfacing. Even with excellent ball cleaning habits, usage of your reactive ball will result in the microscopic pores of the ball’s surface to smooth out thus diminishing friction (hook-ability) between the ball and the lane. Resurfacing restores the sharp edges on the pores of the ball and deep cleans the pores which enables the ball to grip the lane with more friction resulting in more hook-ability. We recommend that you have your reactive ball professionally resurfaced at least once per season or every 60 games. A resurface can make your reactive ball look and perform like it is brand new again! 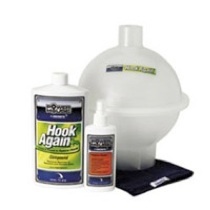 Hook Again: Powerhouse Hook Again is a proven formula to restore hook to “dead” bowling balls. The Hook Again compound extracts oil that has been absorbed into the ball through direct compressive contact. Ebonite’s testing of Hook Again has proven to restore up to 99.8% of performance. Revive your “dead” ball with the double punch of a Resurface and Hook Again treatment!